Amassing recipe cards traditionally started with the bridal shower, when guests were asked to share their favorite recipes with the nearlyweds. Nowadays you can find any recipe at the click of a button; no more "I know it's in here somewhere, I wrote it on the back of a napkin!" (Mom). While your recipe box might not be overflowing with the handwritten cards (or napkins) from yesteryear, we're hanging on to the idea by offering our very own recipe card column. We'll be featuring easy, yummy, beautiful recipes for you to add to your collection, however you choose to store it. Mackenzie Schieck is no stranger to food. The Seattle-based writer, food blogger and formerAllrecipes.com editor is always crafting fun recipes. Her food blog, Pine and Crave (formerly known as "Single Servings") is full of beautiful creations-- great for a healthy dinner inspiration or an easy-to-make breakfast for one. Key in Pine and Crave for more yummy treats! 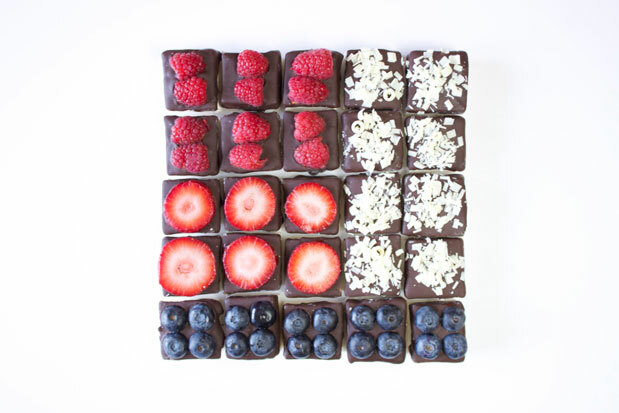 Red, white, and blue toppers of your choice—strawberries (sliced), raspberries (halved), blueberries (halved), shaved white chocolate (I just used a bar of chocolate and a potato peeler), dried pineapple, coconut flakes, gummy candies (sliced), crushed rock candy, etc. 1. In a large mixing bowl, combine 1/2 of a cup of cold water with the packets of gelatin and allow to sit until gelatin forms, about 15 minutes. 2. In a small saucepan on medium heat, combine the sugar, corn syrup, 1/2 of a cup of cold water and stir until sugar has dissolved—about 3 to 5 minutes. Increase heat to bring mixture to a boil. Keep the mixture at a boil until the temperature reaches 240 degrees F on a candy thermometer. Remove from heat. 3. Slowly pour sugar mixture into the bowl with the gelatin, simultaneously using a mixer on low. Gradually increase speed to high and continue whipping until the mix is very thick, about 15 minutes—imagine the consistency of pourable taffy. NOTE: A stand-up mixer is ideal for this type of recipe, but rest assured, you can do this with an electric hand mixer. I did it—it just requires a little coordination and comfortable shoes. 4. Add vanilla to marshmallow mixture, then whip for another 30 seconds or so until it's completely mixed in. 5. Line the inside of a 9×13-inch cake pan with tin foil, then coat with cooking spray. 6. Pour the mixture into the cake pan, smoothing the surface with a spatula. (Spray spatula with cooking spray as needed to keep it from sticking.) Let the marshmallow sit for about 6 hours, uncovered, until completely set. 9. Dust all sides of marshmallow pieces with powdered sugar. 10. Prepare toppers if needed (e.g. slice blueberries in half, dice dried pineapple, etc.). 11. 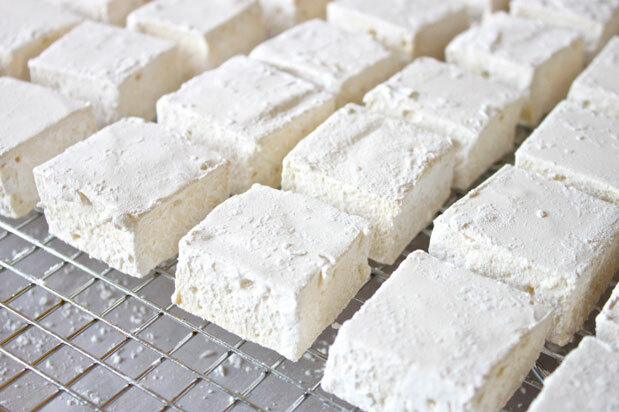 Prepare a cake pan or plate covered with parchment paper to set chocolate-dipped marshmallows on. 12. Over high heat, bring 1 to 2 inches of water to a boil in a medium saucepan. Reduce heat to low and place a bowl in the saucepan. Be sure the water doesn’t get displaced enough to spill over into the bowl. 13. Pour in chocolate chips. 14. Stir until completely melted. 15. Dip marshmallow into chocolate to cover about a 1/2 inch of marshmallow, then place chocolate side up on plate or cookie sheet. 16. 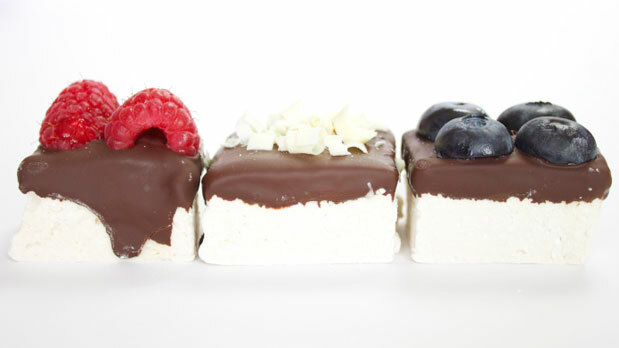 Place toppers on each marshmallow.